Heal Your Puzzle » Blog Archive » It’s a New Year – Fresh Start? New Enthusiasm? It’s a New Year – Fresh Start? New Enthusiasm? January is a useful time to reflect and reassess what is important to you personally. It is a great time to set goals for yourself however small or epic in nature! Your growth is driven by the clarity of your Personal Goal for Your Future, not only for yourself but also for what and who is important to you. Empowering your Goal will clear obstacles that are preventing it happening – these can be physical obstacles, emotional, spiritual or mental; they can be obstacles from the Past hanging around, the Now or even the Future in the form of unrealistic or imposed expectations. When your Goal is Empowered, a personal path for you towards successful completion forms – your Life feels like it has direction and events or inspirations occur to help you grow as a person to fulfil your Goal. Obstacles come in all shapes, sizes and combinations but the first step to Empowering your Goal is to strengthen and clarify your Personal Space in order to truly know your Needs, your Aspirations, and Your Place within your Personal Vision of your Future. A very well-established technique is to visualise a bubble around yourself made from whatever material you wish – adapting it for your level of vulnerability > Fort Knox or soap bubble… it is up to you! Start using this consciously and eventually it will become second nature! When this process is working effectively, you immediately feel less drained, more calm and ready to continue. When such techniques do not solve the problem, it is not that they have failed but that more advanced techniques are needed. 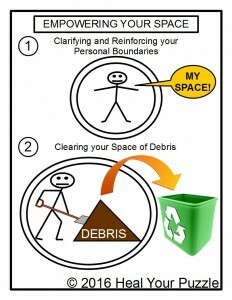 With your boundaries in place, the next step is to clear out any debris. Of course this process is very personal to you and there are no set rules… you set them! Again it can be done with the help of visualising your Space and proactively removing anything that does not fit or does not feel like it is yours. This will happen and progress naturally anyway after Step 1. Watch for times of vulnerability and reinstate your Double Bubble during this clearing process. At first this may feel selfish but the aim is to build healthier, more intelligent boundaries; when this happens, communication with others becomes easier and more enjoyable! Be You in 2016!